Mrs. Yollis' Classroom Blog: Royce Skypes With Jarrod from Australia! On Sunday, I skyped with Jarrod from Australia! I was posting comments on Jarrod's blog about Poptropica. He thought I had interesting comments, so he had his parents email my parents and we set up a time to Skype and play Poptropica at the same time. It was really fun when we were able to connect. At first, we both could see each other. Then Jarrod could not see me anymore, but I could see him the entire time! 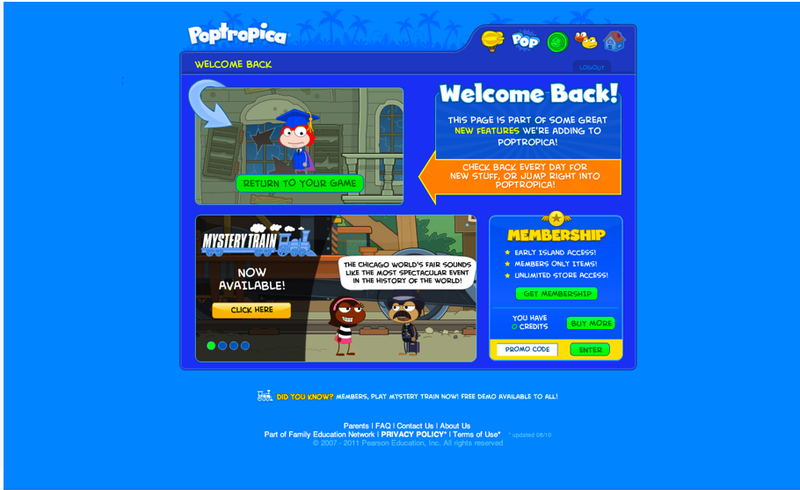 In case you do not know what Poptropica is, head over to Jarrod’s awesome blog and look at his Poptropica post. Also look at his Skyping with Royce post. If you want to be friends over Poptropica, you can choose different rooms to be in. We chose three rooms: the enhanced forest, the crystal cavern, and the techno room. Every room had a code. I really liked playing Poptropica with Jarrod. Jarrod and I understood each other's accents pretty well. It was only hard when we were telling each other the room codes. Have you ever had a hard time explaining something to your friends? I learned that Jarrod has a little brother who is three, he calls dinner tea time, and he wants to come to California and go to Disneyland and Universal Studios. We also learned that his mother lived in Nebraska for two years as an exchange student. She has visited California two times. 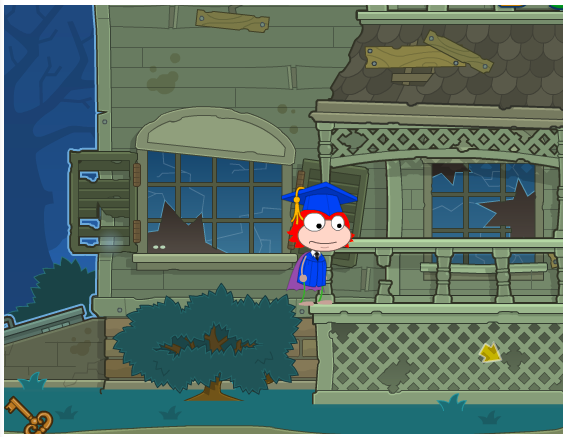 This is what the home screen looks like on Poptropica. You can visit a haunted house! Boo! If you'd like, you can pick out a Halloween costume from the store. Would you want to visit Mount Olympus? Maybe you'd like to climb the rope! It will let you travel to another world! I really enjoyed meeting Jarrod! If you have never played Poptropica, do you ever plan to play? Have you ever Skyped with a friend? Have you ever spoken with a person who had an accent? Congratulations on this fabulous guest post! My name is Mrs Morris and I am Jarrod's teacher. I was so pleased when I found out that you two had organised to Skype! I think it is terrific that you had your parents organise it - you're very cyber smart. Accents are funny things because everyone thinks that they don't have an accent and other people do! Yes, we do call the evening meal tea however some people call it dinner. There are many words in Australia/America that are different and I bet you'll learn more as you get to know us more. I have not played Poptropica but it is very popular in 2KM and 2KJ. I love using Skype and I look forward to organising a Skype call between your class and our class in a few weeks! Keep up your terrific work. It is really cool that you skyped with Jarrod! Thank you for sharing it with us. I have played Poptropica before, it was at a friend's house and I really liked it! I have skyped with my father many times. When he is away, we skype as often as we can. I love skyping because it feels like he is in the room with me. Wow Royce, what a great post! Looks like you had fun with Jarrod, skyping and playing Poptropica. My family visited Australia a few years ago. We loved the Sydney Opera House and the Sydney Zoo. I would love to go back one day, it reminds me a lot of California. Do you know if they celebrate Halloween in Australia? It looked like you had skying with Jarrod! Was that your first time skyping with a friend at home? I have never skyped with a friend before, but I have skyped with my mom when she leaves on a business trip. We had no problems skyping. When Jarrod couldn't see you what did you do? I have not played Poptropica before but I really look forward to trying this game. What a great guest post, you're very lucky to have got one. 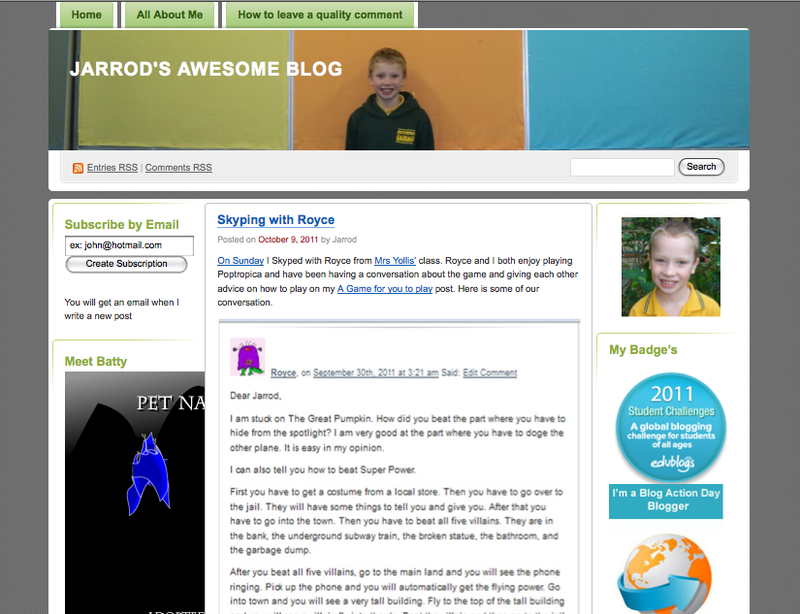 Before I got my own blog I did a guest post on 2KM and 2KJ's blog. I had a great time skyping with you too and can not wait until we can do it again.I like the idea you suggested on my blog. You're very lucky to have got a membership, I have asked for one for my brithday but I have to wait and see if I get one. Congratulations on this fabulous guest post!! My name is Mikayla I am Jarrod's friend.I live in Austalia,Victoria. I was happy to see you and my friend Jarrod skiped each ather at home. 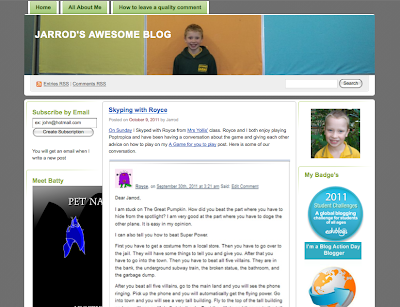 I souer Jarrods blog post about it too but it is his own blog he oned it from living lots of blog comments on the 2KM and 2KJ blog. Yes I have skiped a friend before at my dad's house.He lived in amarica he's name is Alana. I meta hom in amarica when I went to amarica in 2009 when I was in prep at my school.It was fun over in amarica. Keep the graet work up at our school in califona. Stunning interaction between Royce and Jarrod. They show how Skype can be a useful way of sharing. It can be as thought they're in the same classroom while on the other side of the world. Well done, boys! I wonder who in your classes will Skype next? I never played that game before but it sounds interesting. How wonderful for you and Jarrod to be able to skype. Now thats what I call a great connection. I have not played Poptropica but I do know that within my home it is a very popular game BB plays often. 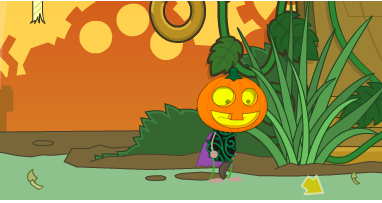 I just played Poptropica and I have to admit it is really fun. I have never played or heard of Poptropica until I saw your post. How did you feel when you skyped with Jarrod? I have skyped with my dad once when he was away on a business trip. It is a great way to keep in touch with people. Was skyping with Jarrod fun? It was really fun when I Skyped With Jarrod! I'd love if Mrs. Yollis would organize a Skype call with your class! I'd also love if one of your students (besides Jarrod) skyped with one of the students in my class (besides me). I also noticed that you do not put a period after your Mrs. We put a period after our Mrs. We say Mrs. Yollis and you say Mrs Yollis. Have you ever noticed anything different about Australia/America (besides the accents and the different pronounciation of words)? I am really excited to have a Skype call with you in a few weeks. Hello, me and my friend Jacob love poptropica. just a thought, try to add more writing then pictures.Be sure to come to our class blog,www.learningin21.edublogs.org please comment on our class blog. You're welcome! It was really fun when I skyped with Jarrod! I Skype with my grandma and my cousins. I try to Skype with them a lot just like you. The only problem is sometimes I can't see them very well. Have you ever had a hard time seeing someone over Skype? I am glad you thought Poptropica is fun! I also think Poptropica is really fun! 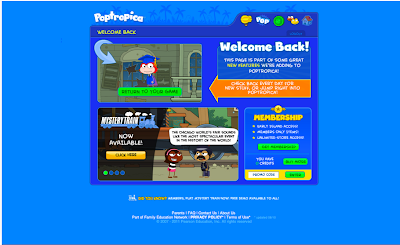 Did you use your friends account while playing Poptropica? Mrs. Morris said that we are going to Skype with 2KM and 2KJ in a few weeks! I cannot wait to Skype with them in a few weeks! Can you wait? Thank you for writing back to me. That is a sign that you're a very committed blogger! You are very observant to notice that we don't put a period after Mrs or Mr. Another funny thing is we do not use the word period. Instead, we say full stop. Here is another interesting difference. In words ending with or we add a u and you do not. For example, we write neighbour, colour, flavour, whereas you would write neighbor, color and flavor. Let me know if you think of any other differences. I did have fun playing Poptropica with Jarrod! I have never been to Australia. I would love to visit The Sydney Opera House and the Sydney Zoo! A poll held an Australian news site (news.com.au) said that 85% of Australians think Halloween should be "ditched." They think that the holiday is "totally irrelevant." However, it said that 15% of Australians love it and wanted to keep it. I'm guessing that the 15% that love Halloween are kids. I play Poptropica too! I want to Skype with you. If we could Skype with each other that will be cool. It would be cool If we could Skype together. I play Poptropica too. Maybe we could compete. I did have fun Skyping with Jarrod! It was my first time Skyping with a friend, but I have Skyped with my relatives. Which friend would you want to Skype with? I did not have a problem skyping, but Jarrod did. He could hear me so we just talked. It will take days, maybe months to get good at Poptropica. Do not be frustrated if you are bad at it. Do you play any other games on the Internet? I wish that I can skype with Jarrod,it’s so much fun and interesting. We can also learn a lot about other countries, culture, and structures. I never played proptropica before, but I would like to learn how to play it.